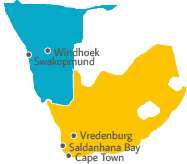 A 100% South African owned company, with level 2 BEE compliance, backed by a Black Economic Empowerment plan, established in 1990 with it’s head office in Killarney Gardens, Milnerton, 30 km from Cape Town as well as strategically placed service outlets in Saldanha Bay, Vredendal, Swakopmund and Windhoek, Namibia, effectively covering the West coast of Africa up to Ruacana Power Station on the Angolan border. At all these branches Blue Cranes only employ local residents which are trained in our line of business. We at Blue Cranes offer the services of our highly experienced lifting equipment technicians to inspect, service, load test and maintain your lifting equipment as laid out in the Occupational Health and Safety Act with no exception with the make or model. Most of the Technicians employed by Blue Cranes are registered with the Engineering Council of South Africa (ECSA) as Lifting Machinery Inspectors (LMI’s). From our 850 square meter workshop in Cape town and our 540 square meter workshop in Saldanha, with overhead cranes, our company is capable of manufacturing box and beam girder cranes of up to 25 meters long, jib cranes or crawl beams to customer specification or even renovating massive overhead cranes or small repairs to chain hoist. Our technicians are on 24-hour standby, with the back-up support of various original equipment manufactures, servicing at set intervals, responding to breakdowns or able to place a technician on your premises on a full time basis, maintaining only your equipment. Part of our factory is used as a store where we stock most spare parts that is normally required on day to day basis, or consignment stock as required by some of our customers. No matter what make of equipment you have, we at Blue Cranes will be able to sort out any problem in the shortest possible time. Blue Cranes are above the hook specialists and although we do not manufacture our own range of below the hook loose rigging gear, we do supply high quality products, which range from chain blocks, lever blocks, steel wire rope slings, material slings, chain slings and shackles. As a matter of fact we can supply most other items that might be required for the lifting of any material or equipment. Our ISO 9001/2000 and OSHAS 180001 documentation and systems has been audited and found in order by various customers. Blue Cranes is the only lifting equipment service company in the Western Cape that is accredited to train apprentices and currently we have 5 in the system. All customers and potential customers are invited to visit our Killarney Gardens offices or branches at all times.